For the last few years there has been a huge hype revolving the 3D technology. The entertainment industry has been prompt to embrace this boom as can be seen with the production of 3D movies and the use of 3D glasses in the theatres. However, unlike the entertainment industry, other industries are a bit wavering to adopt this new technology and the medical industry is one of them. The nature of work which goes on in the 3D technology field is extremely delicate and according to the experts, this is the main reason the medical industry is reluctant towards the 3D technology. 3D organs, skeletons and cadavers are used as teaching aids in the medical institutions. Apart from this, most medical professionals have turned away from recognizing the usefulness of this technology. In the midst of this uncertainty, there is good news that the scenario is expected to change in the near future. With this hope in view, letâ€™s start our discussion. Recently, a joint research has been conducted by the experts from Klinikum Rechts Der Isar University hospital, Heinrich Hertz Institute and Fraunhofer Institute for Telecommunications. They have shown that the latest 3D technological advancements for example, the advanced 3D glasses and display screens, are going to be highly beneficial to the physicians. Near about 50 surgeons took part in the study and all of them had something to say optimistic about the 3D systems and that too both with the glasses and without the glasses. According to them, although the technology requires some enhancement, the use of the special glasses in the operating rooms cannot be understated. Earlier, surgeons were hesitant to use 3D glasses but now after the study, the researchers are confident that this high-end technology will make a smart entry into the medical field. According to a physician (who participated in the study), at the initial stage, the experienced physicians were not convinced regarding the new technology. The reason was not that the technology had no strong benefits to offer to medical practices but it was mainly because of the fact that they were extremely uncomfortable with watching the screen while conducting a surgical procedure. The physicians preferred to count on their own experiences. Recently, the already high-end screen technology got more advanced. The objective of this study was to highlight this aspect. The 4K models that are ruling the market currently are designed with a resolution of 3840 pixels by 2160 pixels. 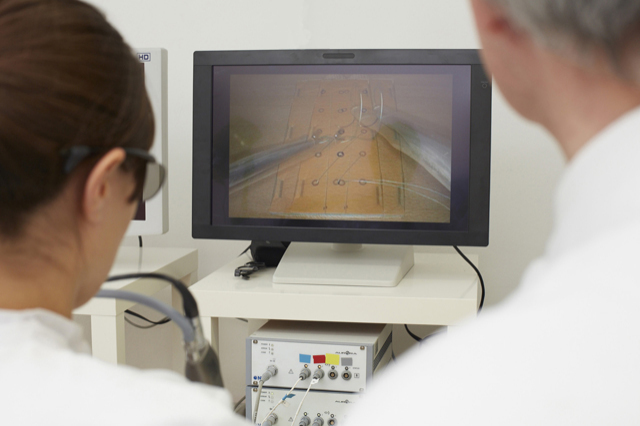 They offer HD resolutions that are just perfect for medical practices. Now, the 8K models are going to emerge in the market. They are equipped with ultra-HD resolution of 8192 by 4320 pixels. As the researchers say, the 8K models will be a major breakthrough in the medical industry. In the study, four different systems were tested by the surgeons from the Klinikum Surgical hospital. The surgeons demonstrated a routine surgical procedure. The images of the procedure were taken with the help of endoscopic cameras. Just like any non-invasive surgical operation, the procedure executed in the study involved sewing up a replica of cavity with ten stitches. The surgeon had to depend on the screen completely since he was not able to take a view of his hands. The results of the study were positive and exciting. With the help of the glass-based system, the duration of the procedure was shortened by 15 percent and the surgeon experienced no problems while carrying out the procedure. In comparison to the 2D model, the hand movements were easier. Even the experienced surgeons were all praise for the 3D technology. The advanced eye-tracking technology works with cameras that track both eyes separately. This makes it possible for each eye to view a different image. So, the technology creates a 3D effect and glasses are not required to experience the effect. The surgeons participating in the study received the opportunity to compare the quality of the technology with that of 2D. It is worth mentioning that the three-dimension system didnâ€™t rank first. Regardless of the fact, this study has proved to be an eye-opener to the medical professionals who have been doubtful about the value of 3D technology in the medical field. Many are of opinion that 3D technology is an option that the surgeons may consider incorporating into their medical practices. But with this study enlightening the positive influence of 3D technology in the medical field, it can be said that now, this advanced technology is a necessity that every surgeon should choose if they are determined to enhance the medical scenario for them as well as for their patients. The day is not much far when we will get to see a join up of these two fields. How New Medical Technology Affects Health Care Costs? Justin Brown is a freelance blogger. He used to run a fitness training center in Massachusetts a year back, but now he is working as a nutritionist at a reputed firm. He specializes on alternative medicines, dietary supplements and oral hygiene.